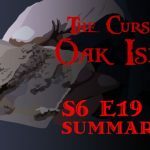 The following is a Plot Summary and Analysis of Season 6, Episode 11 of the History Channel’s TV series The Curse of Oak Island. 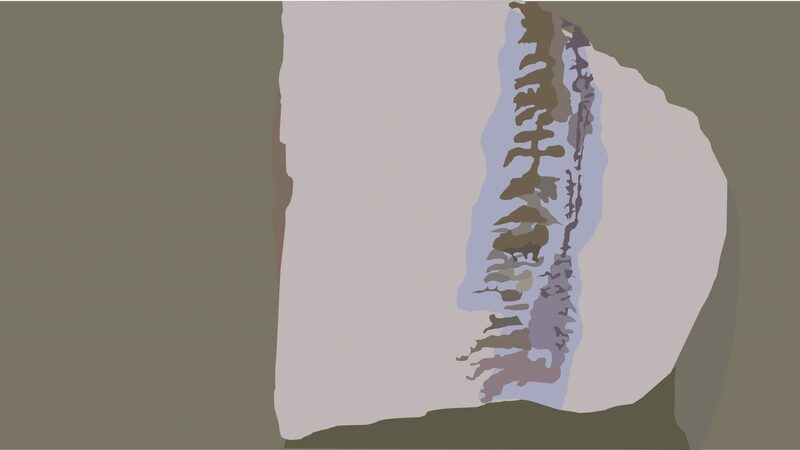 An interpretation of the subterranean wall at Smith’s Cove. 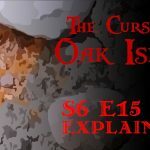 Rick Lagina, Craig Tester, and Terry Matheson uncover the new underground wooden wall at Smith’s Cove, discovered at the end of the previous episode. Rick observes that the wall appears to form the shape of the letter ‘L’. 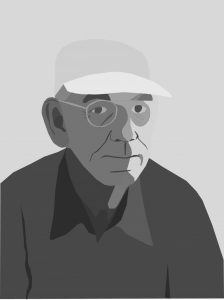 The narrator then informs us of a hitherto undisclosed discovery which Dan Blankenship made in the 1970s. When conducting his own excavation of Smith’s Cove, Dan partially uncovered a 50-foot-long L-shaped wall made of wood. This L-Shaped structure roughly paralleled the southern half of the U-shaped structure, and was located further from shore than the latter. In an interview, Rick Lagina voices his suspicion this this structure was perhaps the remains of an “abortive attempt” at a cofferdam which proved “too much work for the result”. The U-shaped structure and the L-shaped structure. That night, the Oak Island crew congregates in the War Room to discuss the results of the LIDAR scan of Tory Martin’s stone, which was carried out the previous episode. Rob Hyslop and Ryan Levangie, the men who conducted the scan, explain that the results of their operation indicate that one of the stone’s sides is perfectly flat, indicating that it may have been worked by man. An interpretation of the Tory Martin stone. Hyslop and Levangie also display the results of their attempt to define the markings on the stone. Doug Crowell suggests that the two men’s interpretation of the markings resembles Futhark, a runic alphabet used by Dark Age Germanic tribes. 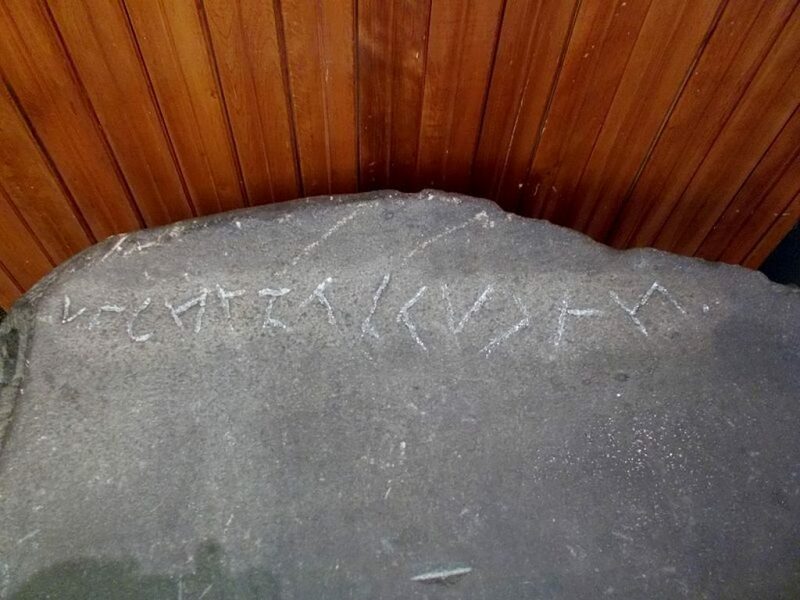 Charles Barkhouse then informs the crew that the Yarmouth County Museum, located on the southern shores of Nova Scotia across a narrow strait from Overton, houses the Yarmouth Runic Stone, a flat stone bearing an inscription which some have interpreted as Norse runes. The narrator then launches into a brief description of the theory which contends that the Money Pit was constructed by Vikings. An interpretation of the inscriptions revealed on Tory Martin’s stone. 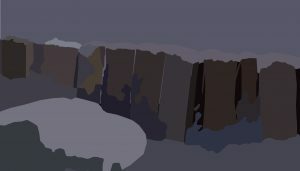 The next day, Gary Drayton, Laird Niven, and Terry Matheson resume the investigation of the newly discovered underground wall at Smith’s Cove. Niven and Matheson laboriously expose the structure by hand using shovels, while Drayton scans a recently-excavated area nearby with his metal detector. 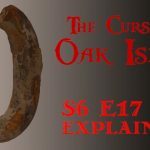 Drayton quickly discovers a piece of curved lead which he suggests might be a fragment of a bracelet. 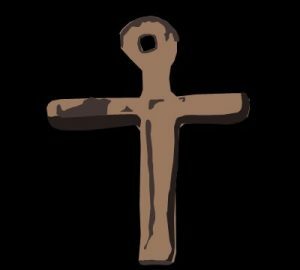 The narrator then reminds us of the lead cross discovered on Smith’s Cove the previous season and suggests that there might be some sort of connection between it and this newly discovered artifact. Later that day, the crew meets in the War Room to discuss future operations in the Money Pit area. Craig Tester suggests that they sink multiple shafts in the direction in which the supposed Shaft 6 tunnel appears to lead. Most of the treasure hunters appear to concur with Tester’s proposal. 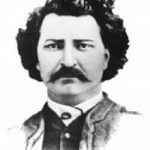 Marty Lagina then states the he would like to “have a re-go at H8”, in which some of the previous season’s most intriguing discoveries were made. The crew agrees that this ought to be their first priority. Later, members of the Oak Island team meet at the Money Pit area with Vanessa Lucido, Danny Smith, and John Lee of ROC Equipment. Marty Lagina explains that he would like ROC to remove the contents of Borehole H8 with a hammergrab. 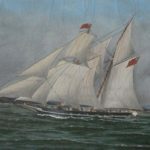 That accomplished, he would like the crew to raise the caisson to a depth of 170 feet in the hope that the supposed Chappell Vault, which the H8 caisson may have pushed to the side, will fill the void. 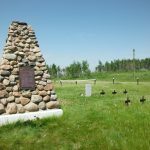 While the ROC crew set up their oscillator at the Money Pit area, Alex Lagina and Paul Troutman drive to the Yarmouth County Museum in Yarmouth, Nova Scotia, in the hope of shedding some light on the runic-like inscription on Martin’s stone. The pair arrive at the museum and locate the Yarmouth Runic Stone, whereupon the narrator relates the story of the stone’s discovery in 1812 by a local doctor and the various hypotheses surrounding its inscription. As they admire the stone, Alex and Paul are approached by the museum’s director, Nadine Gates, and her assistant, Lisette Gaudet. 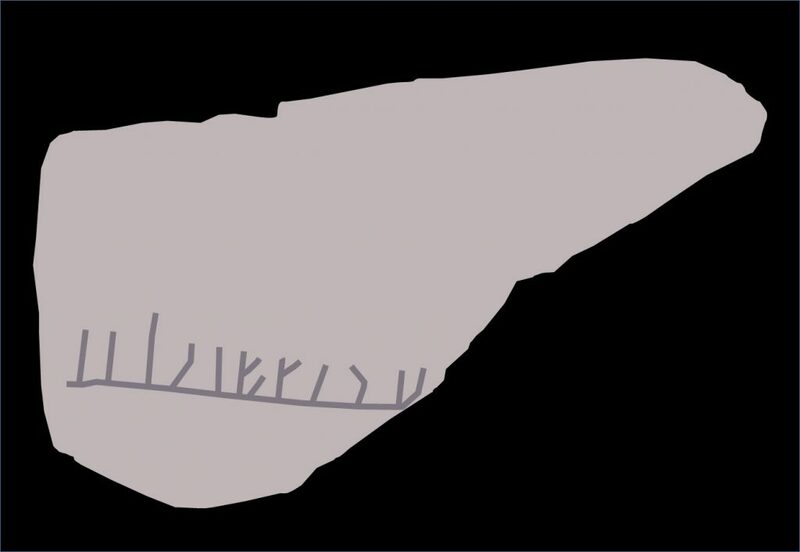 Upon being prompted by Troutman, Gates explains that some believe the inscription on the Yarmouth Stone to be Norse, and translate it as saying “Leif to Erik”. The implication of this translation is that the stone constitutes a monument commissioned by Viking explorer Leif Erikson in honour of his father, Erik the Red. After Marty and Alex Lagina give Mike Jardine of Irving Equipment Ltd. the green light to set up a crane over H8 in preparation for the upcoming hammergrab operation, Alex, Rick Lagina, and Laird Niven head to Smith’s Cove, where most of the L-shaped structure has been exposed. While chatting with Alex, Niven remarks that the absence of iron in any of the Smith’s Cove structures is very strange, and states “archaeologically, I don’t think anyone in Nova Scotia has seen this”. Niven then tells Rick Lagina that, although he initially believed the U-shaped structure to be a relic of previous searchers, the discovery of the L-shaped structure has made him less certain of this belief. While the treasure hunters talk, heavy equipment operator Billy Gerhardt uncovers a long wooden log with his backhoe. Further excavation reveals this log to be part of a larger platform which Rick Lagina suggests is a “slipway”, or boat ramp. 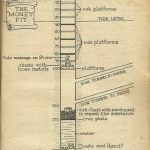 “This could be the Hedden wharf,” he concludes, whereupon the narrator explains that, in 1936, Oak Island treasure hunter Gilbert Hedden built a wharf at Smith’s Cove, with which he intended to transport excavation equipment to the island. During this operation, he and his crew discovered the pallett-like structure elaborated upon in the previous episode, which Hedden believed to be a skid. 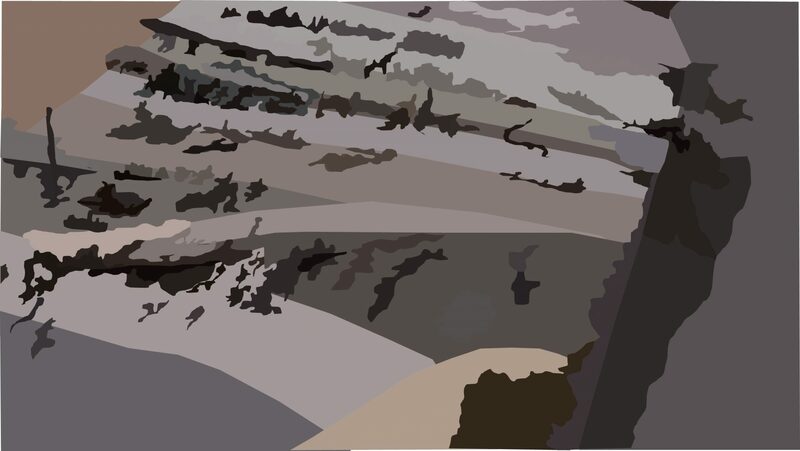 An interpretation of the slipway at Smith’s Cove. After the narrator’s exposition, Rick Lagina wonders aloud whether this new structure comprises the remains of Hedden’s wharf or is part of the older skid that Hedden discovered in 1936. Alex Lagina then remarks that this structure appears to be in line with the L-shaped structure and suggests that the two might be connected in some way. 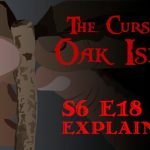 Rick agrees that they ought to investigate this potential connection. Later, at the Money Pit area, the treasure hunters stand by as the crew of Irving Equipment Ltd. begins removing mud and clay from H8 via hammergrab, expressing their hope that the upcoming excavation will yield the artifacts that somehow eluded them the previous year. An interpretation of Oak Island treasure hunter Dan Blankenship. 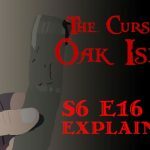 In this episode, Rick Lagina, Craig Tester, and Terry Matheson exposed the wooden wall at Smith’s Cove discovered at the end of the previous episode. This wall forms the shape of the letter ‘L’. It is congruent with the southern half of the U-shaped structure, but is located further from the island. Following its disclosure, the narrator revealed that Dan Blankenship discovered this structure in the 1970s. In addition, according to Lee Lamb in private correspondence with this author, Mildred Restall, in the 1960s, “discovered a partial wooden wall outside (that is- beyond) the cofferdam”. Although the purpose of this structure is not known, Rick Lagina suggested that the L-shaped structure constitutes an “abortive attempt” at a cofferdam which proved “too much work for the result”. 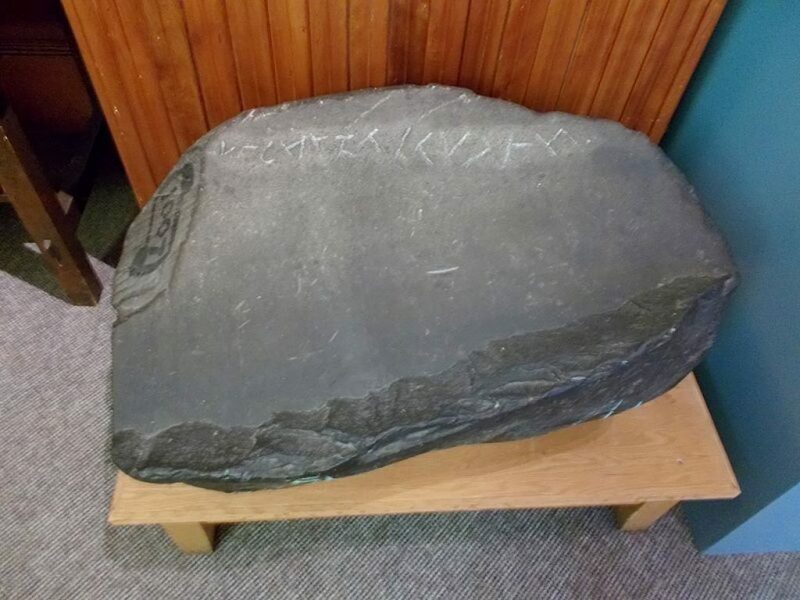 In this episode, Tory Martin’s stone, in light of the rune-like markings revealed on its surface, was compared with the Yarmouth runic stone, an artifact currently housed in the Yarmouth County Museum. The Yarmouth rune stone, also known as the Fletcher stone, is a 400-pound flat slab of quartzite bearing an inscription which some have interpreted as Norse runes. 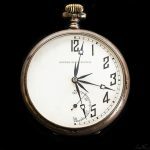 The stone was discovered by Dr. Richard Fletcher, a retired British Army surgeon, in the early 1800s, and revealed to the public in 1812. Some believed the inscription to be proof that the Vikings had visited the southern shores of Nova Scotia during their New World voyages. In 1884, a man named Henry Phillips Jr. wrote a paper in which he argued that the inscription on the Yarmouth stone were Norse runes which translate to “Hako’s son addressed the men”. 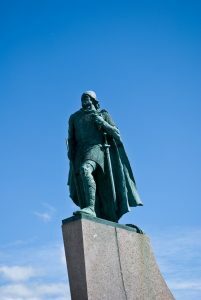 Phillips then attempted to identify Hako as Thorfinn Karlsefni, a Norse explorer who features in the Icelandic sagas which describe Norse voyages to the New World. “Hako’s son”, in this case, would be Karlsefni’s son, Snorri Thorfinnson, the first Caucasian child to be born in the New World. In 1934, a student of runology named Olaf Strandwold proposed that the inscription on the Yarmouth stone reads “Leif to Eric raises (this monument)” in Norse. This interpretation implies that the stone was carved by Viking explorer Leif Erikson, the Viking who discovered Vinland, as a tribute to his father, Erik the Red. 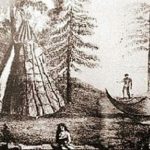 In spite of these various interpretations, many experts have conclude that the markings on the stone are nonsensical, and that the Yarmouth stone is likely a hoax. 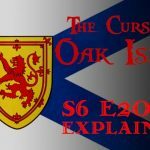 In this episode, we are introduced to the vague theory that Norse Vikings are behind the Oak Island mystery. 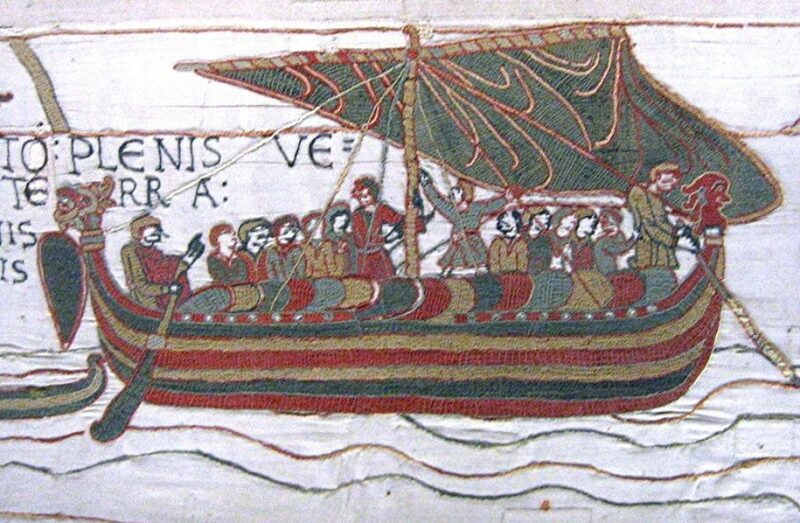 For centuries, Scandinavians have told tales of medieval Viking voyages to the Americas that took place around the turn of the last millennia. In the 13th Century, Icelander chroniclers put these tales to parchment, writing the Saga of Erik the Red and the Greenlander Saga. Although the tales outlined in these sagas are very different from each other, they generally agree that, around 1000 A.D., an Icelandic Viking named Leif Erikson sailed west from Greenland. Whether following up on the tale of another Norse mariner who had been blown off course, or being blown off course himself in an attempt to bring Christianity to Greenland, Leif came upon three mysterious western lands. 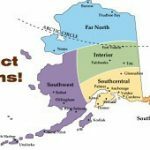 The northernmost of these a barren country of flat rocks and arctic foxes, which he called Helluland (“Flatstoneland”). 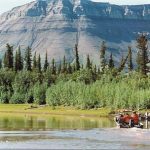 Further south, he came to a land of evergreen forests, white shores, and wild animals, which he called Markland (“Forestland”). South of Markland, Leif Erikson and his crew discovered a place filled with lush grass and wild grapes, which they called Vinland (“Wineland”). In the years that ensued, Leif Erikson’s friends and kinsmen would make three more voyages to Vinland in an attempt to explore and possibly establish a colony. They were ultimately driven back to Greenland by diminutive fur-clad natives whom they called Skraelings. Today, archaeologists generally agree that the Viking sagas have some truth to them, and that Norse explorers indeed visited the shores of the New World around 1000 A.D. 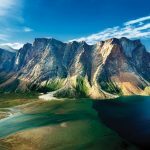 Most agree that Helluland is likely the eastern shores of Baffin Island, and Markland likely northern Labrador. The location of Vinland, however, is hotly contested. 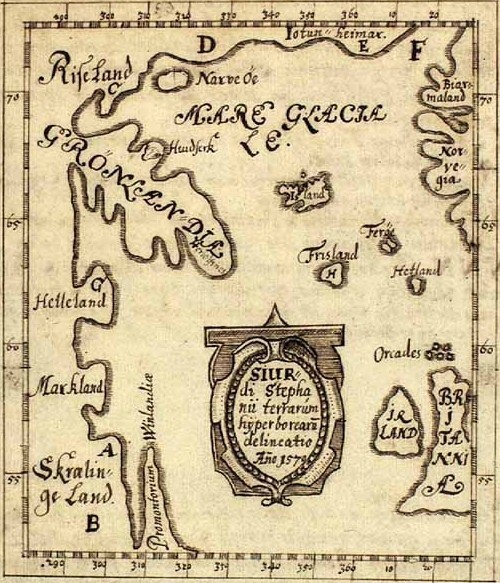 Many believe that Vinland is likely the Great Northern Peninsula of Newfoundland- a theory that was bolstered in 1960 by the discovery of Viking ruins near the town of L’Anse aux Meadows. Others content that Vinland must be located further south, as wild grapes do not grow naturally north of New Brunswick. 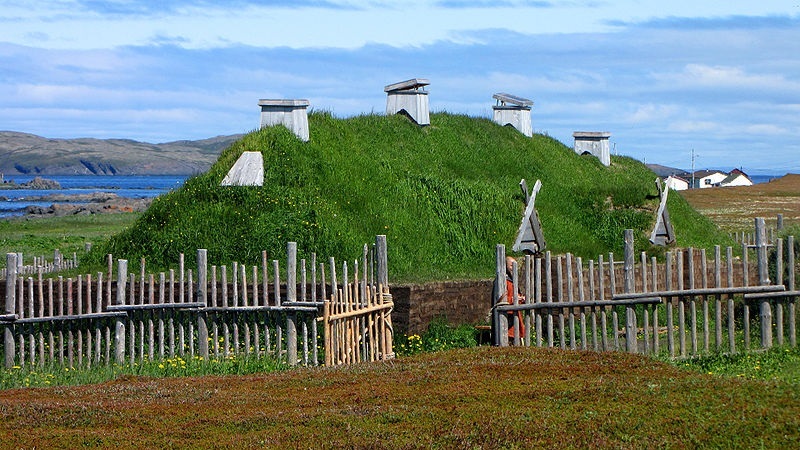 A replica Viking longhouse at L’Anse aux Meadows, Newfoundland. Although there is conclusive evidence that medieval Vikings did visit the shores of Eastern Canada, there are no indications in the sagas or otherwise that the Norsemen built anything like the Money Pit during their New World voyages, nor that they had cause to bury bury anything other than their fallen comrades on Vinlandic soil. Near the end of the episode, the Fellowship of the Dig discovered what appeared to be the remains of a wooden slipway, or boat ramp, beneath Smith’s Cove. This structure appears to be composed of long wooden logs which had been lashed together like a raft. 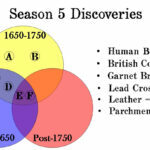 Whatever means by which the logs were originally adhered to each other remains a mystery, as the structure does not bear evidence of any fastenings. Both ends of the logs rest on perpendicularly-aligned timbers. The prevailing opinion among the treasure hunters was that this structure constitutes the remains of the wharf that Gilbert Hedden constructed in the summer of 1936 for the purpose of transporting equipment to the island. 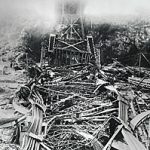 The narrator also suggested that this structure might be the remains of the older skid discovered by Gilbert Hedden in 1936, which was elaborated upon in the previous episode. The fact that this structure bears vague resemblance to the skid described and drawn by Hedden neither verifies nor discredits this latter theory. Although the construction of Hedden’s Wharf was not alluded to in The Oak Island Mystery by R.V. Harris (a book containing one of the most comprehensive accounts of the Hedden treasure hunt), the writings of Lee Lamb and Bobby Restall indicate that Hedden’s Wharf was known to and used by the Restall family in the 1960s. In her 2012 book Oak Island Family: The Restall Hunt for Buried Treasure, Lee Lamb (the daughter and sister, respectively, of Oak Island treasure hunters Robert and Bobby Restall) claimed that “local boatmen had kept the wharf in good repair since Gilbert Hedden had ended his search for treasure on the island in .” Later on in the book, Lamb relates that, during a number of violent storms which buffeted the island in the 1960s, “Hedden’s Wharf was reduced to its stone bed, not a stick of wood remaining”. 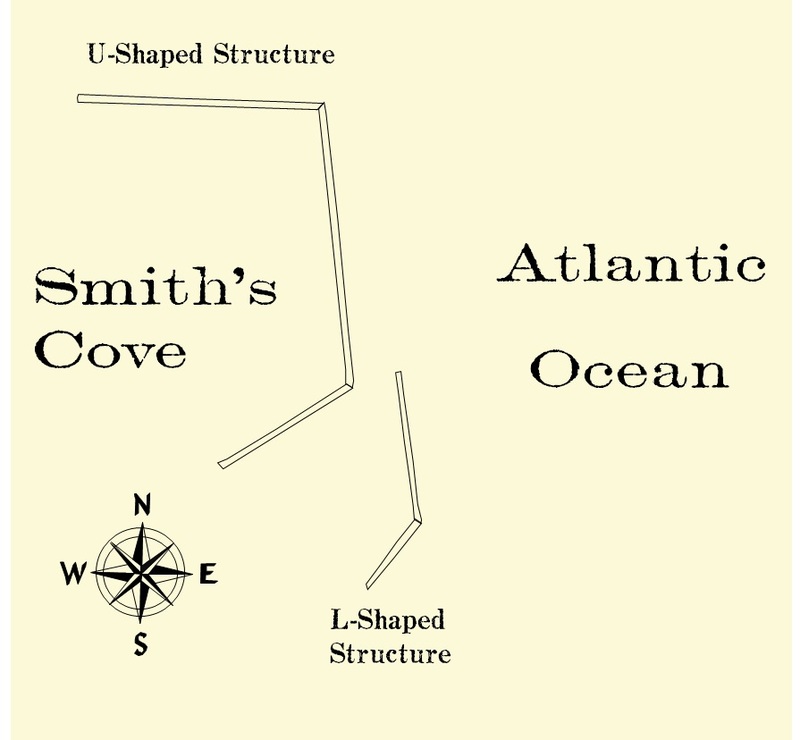 Considering all we know about the various structures as Smith’s Cove, this passage is very confusing. First, we must determine what Bobby Restall is referring to when he uses the word “cofferdam”. It seems likely that Bobby’s cofferdam is either: a) the U-shaped structure; or b) the newly-revealed L-shaped structure, which appears to have once been congruent with the U-shaped structure, but which lacks more than half of its northern section. 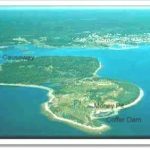 If the “cofferdam” Bobby was referring to was the U-shaped structure, then it appears that he mistook his directions when he wrote that “the north one-third of the… cofferam” was dismantled and used to create Hedden’s wharf. The northern section of the U-shaped structure appears to be completely intact. However, sketches indicate that roughly 1/3 of structure’s the southern arm may be missing. Perhaps Bobby meant to write “south” instead of “north”. It is also possible that the “cofferdam” Bobby was referring to was the L-shaped structure, which appears to be missing much of its northern section. If this is the case, then it seems that Bobby got is directions right and his ratios wrong; the L-shaped structure today appears to be missing more than half of its northern section (i.e. far more than a third). It must be mentioned that the two successive paragraphs of Bobby’s essay in which the passage in question is ensconced render the passage even more confusing. While they were doubtless clear and straightforward at the time of their composition, these paragraphs are rendered cryptic by all the new information we have, and could serve to support either of the previously mentioned possibilities depending on their interpretation. “In Smith’s Cove we found bits of coconut fibre and evidence of earlier searchers’ work that is unrecorded. It took the form of old plank walls buried under the sands of the beach, also five vertical board boxes built to protect drill holes of past years. It is unclear whether the “cofferdam” mentioned in the second paragraph is a reference to the “old plank walls” mentioned in the first paragraph, the walls being evocative the L-shaped structure, or to another structure (ex. the U-shaped structure) which was presumed to be well-known to the reader and required no preamble. Whatever the case, the disparity between the materials of which the U-shaped, L-shaped, and raft-like structures are comprised, coupled with Bobby’s statement that the Hedden wharf was built from the northern third of the cofferdam, seem to indicate that the supposed slipway discovered this episode does not constitute the remains of Hedden’s wharf after all. However, when one considers Lee Lamb’s statement that the original Hedden wharf was reduced to its stone foundation by violent Atlantic storms, it seems possible that the slipway might be the remains of the wharf rebuilt by the Restalls. There is yet another possibility regarding the identity of the “slipway”. 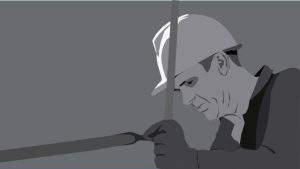 In an email, Lee Lamb sent this author an image which she said depicted Robert Restall constructing cribbing intended for a Smith’s Cove shaft he had sank. The structure Restall appears to be working on in the photo is composed of logs lashed together, the ends of which rest on the upper lip of the shaft in question. Despite being composed of smaller logs, this structure bears remarkable resemblance to the “slipway” discovered this episode; perhaps the slipway is the remains of one of these structures.